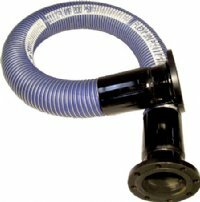 Novaflex Pump-Flex Composite Hose is specifically designed for the Pump Rental Industry. This suction & discharge composite hose provides extreme flexibility, light-weight handling and excellent service life. Excellent for the transfer of water, dirty oily water and light chemicals. Rated for full vacuum. (Consult Novaflex Chemical resistance chart for chemical compatibility before use). Crimped couplings: Other fitting combinations available.